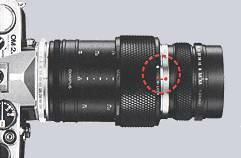 The Telescopic Auto Tube is another example of Olympus’ dedication to close-up photography. Although there have been a few telescopic extension tubes for other systems, most of them do not provide automatic diaphragm or exposure, and only one (the Konica Auto Helicoid AR) is designed to complement specific macro lenses. Compared with the Auto Bellows, it has a longer minimum extension (65 mm instead of 36 mm) and shorter maximum extension (116 mm compared with 198 mm), but its metal construction makes it stronger then the leather bellows, and it provides an automatic diaphragm without needing a double cable release. With the Zuiko Auto-Macro 135mm f/4.5 lens, the focusing range can be varied continuously between infinity and a magnification of 0.43×. 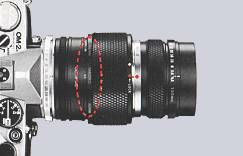 With the Zuiko Auto-1:1 Macro 80mm f/4 lens, there is a continuous magnification range from 0.5× to 1.2×, and by adding the Close-up Lens 80mm Macro f=170mm this can be changed to 1× to 2×. The tripod mount allows the tube (and therefore the camera body) to be rotated through 360° and locked in any position. It can be removed for hand-held photography. The first version of the tube is engraved with an extension scale from 65 mm to 116 mm in increments of 5 mm, and with magnification scales for the 80mm and 135mm auto macro lenses. In the second version, magnification scales were added for the Zuiko Auto-Macro 20mm f/2 lens and the Zuiko Auto-Macro 38mm f/2.8 lens. In common with all other extension tubes, the additional extension requires exposure compensation, but this is normally handled by the camera’s TTL exposure meter. There were two versions of the Tube. The first version, introduced in 1980, has markings for the Zuiko Auto-1:1 Macro 80mm f/4 lens and the Zuiko Auto-Macro 135mm f/4.5 lens. The later version retains these and also has markings for the Zuiko Auto-Macro 20mm f/2 lens and the Zuiko Auto-Macro 38mm f/2.8 lens. There were also 2 versions of the included Tripod Mount, one with the locking knob on the left and the other with the knob on the right. The Mount can be removed and reversed, but this does not convert the left-handed version to a right-handed version. See also Auto Extension Tubes, Extension Tubes. The Tube can be fitted to the Focusing Stage and the Focusing Rail, to make focusing easier and to adjust balance on a tripod. In order to use Tube with the Macrophoto Stand VST-1, remove the tripod mount, attach the Tube to an OM body, and attach the OM body to a Focusing Stage and Focusing Rail. If the tripod mount is attached to a Focusing Stage, the optical axis of the Tube is about 20 mm out of line with the axis of the Stand; this does not have much effect with reflected light, but it prevents transmitted light being used. The Tube cannot be used with the Slide Copier. The Tube does not have a mechanism for stopping down the iris diaphragm in the Auto-Macro lenses, so it needs to be used with a camera adapter that converts the auto diaphragm to click stops. 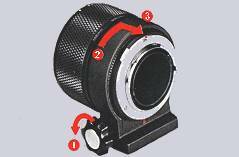 All of the adapters for using OM lenses on Canon EOS digital SLRs provide this facility. We are sure your Telescopic Auto Tube 65–116 will become a valuable component in your OM System. This unique instrument functions as a portable bellows or variable extension tube for outstanding versatility and convenience in macro photography. Especially when used in conjunction with the Zuiko MC Auto-Macro 135mm F4.5 lens or MC 1:1 Auto-Macro 80mm F4 lens, this unit is unusually maneuverable, and extremely suitable for outdoor action macro photography. To enjoy your macro photography with great pleasure, make yourself familiar fully with the use of this unit and obtain optimum performance from this equipment. Rotating the tripod mount by 180°, bring the clamping screw to the top. Pull out the tripod mount. Aligning red dots, insert the Auto Tube into the tripod mount. Rotating the tripod mount by 180°, bring the clamping screw to the bottom and clamp. 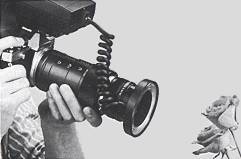 *For shooting with the camera and Auto Tube without a tripod, it is convenient to detach the tripod mount. 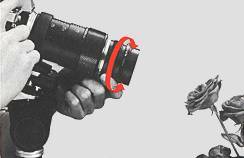 Aligning red dots, insert and rotate the lens until the lens release button springs up and you will hear a positive “click”. 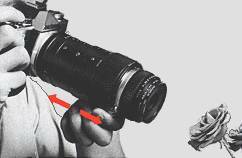 To detach the lens, press down on the lens release button and turn the lens counterclockwise. 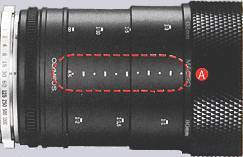 Aligning red dots, turn the Auto Tube clockwise until the tube release button springs up with a “click”. To detach, press down on the tube release button and turn the Auto Tube counterclockwise. (1) Rotate the slide ring in the direction of the white arrow to lock, or (2) rotate it in the opposite direction to unlock. Move the slide (knurled) ring back and forth until you obtain a picture magnification as desired. Pull out the extension rings all the way and lock. 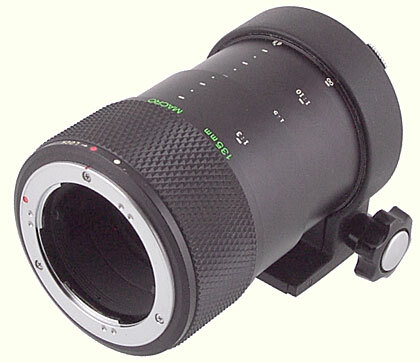 The photo above shows that the magnification for the MC Auto-Macro 135mm lens is 1:2.6 (1/2.6×), thus a correct magnification is indicated by the number (white) in the column that is subjacently aligned with the designation (green) of the lens used. 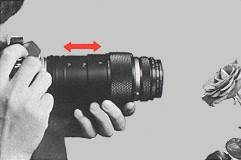 A correct magnification can be ascertained after locking the Auto Tube. 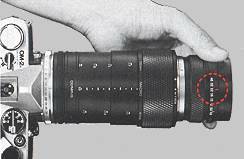 * The maximum magnification of each lens can be obtained when the Auto Tube is at full extension. 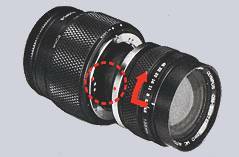 * The focusing ring of the lens is most compressed. * Make it a point to insert the extension ring (A) into the slide ring fully; otherwise the magnification indication may misread. The numbers (white) in a subjacent column just below the lens designation (green) indicate picture magnifications for each lens. The scale A is graduated between 65mm and 116mm in 5mm increments. 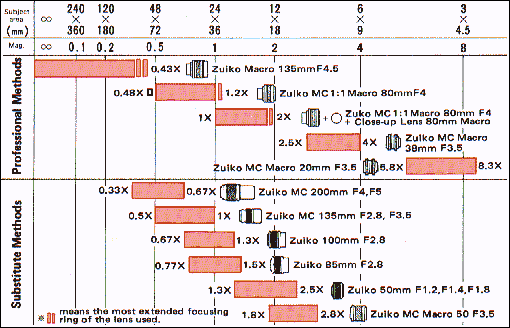 Refer to the chart of photographic ranges for the magnifications of various lenses. Set a picture magnification as desired on the Auto Tube, and lock. Set the OM-2 on AUTO. If you wish to touch up the composition as you look through the viewfinder, unlock and move the slide ring back and forth slightly. * Lenses: 1:1 Auto Macro 80mm F4 + Close-up Lens 80mm Macro. 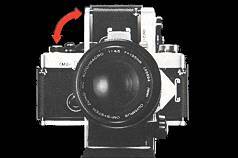 Determine the lens aperture according to the exposure mode of the camera used. * Refer to the manual for the OM System Macrophotography at pages 13-14. A brighter subject image can be checked for focus with ease at full aperture before the shutter release, because the Auto Tube will stop down the lens aperture automatically at the moment of exposure. You can also bring a subject into focus smoothly by moving your body and camera back and forth. As the field of view is generally dark in macrophotography, it is recommended to select a proper focusing screen most suitable for your purpose. 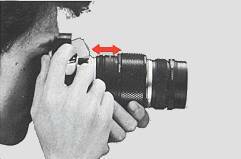 It is convenient to adjust fine focus by means of the focusing ring of the lens when using a tripod. This allows for critical focus without having to adjust the Auto Tube or tripod. 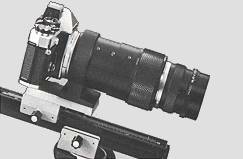 The focusing rail and focusing stage, both optionally available, are recommended to make fine focusing or the camera movement on a tripod easier. 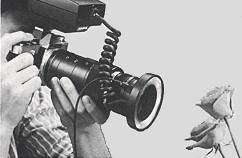 When mounted on a tripod via the Tripod	Mount, the camera can be held horizontally or vertically as you like without displacement of the lens center at all. 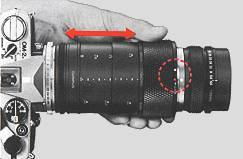 In case of the Auto-Macro 135mm lens, the back and forth movements of the slide ring permits focusing in a range from close-up to infinity. 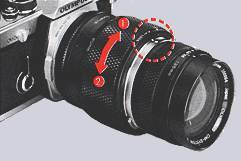 For telephotography, however, compress the slide ring and extension rings most and, looking through the viewfinder, use the focusing ring of the lens for focus adjustment even for infinity (∞). The more the lens aperture is stopped down, the more the depth of field is increased, and so is the acceptable zone of sharpness. In conjunction with the optional T10 Ring Flash 1, the Auto Tube is most recommended for photography of a subject that permits only a small working distance or requires a shadowless light illumination, even by handheld operation of the camera. The T10 Ring Flash 1 (optional) is provided with a built-in illuminator for composition and focusing in poor lighting condition. * As a power source for this illuminator the 6V Power Pack 2 or AC Adapter 3 is available. 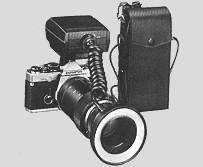 In combination with the camera body OM-2 and Electronic Flash T32, the Auto Tube can be used in the TTL “off-the-film” Auto Multi-flash photography with ease. 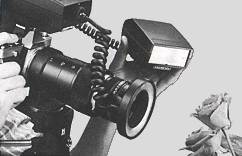 Cameras: OM System camera bodies. Lens mount: OM Mount bayonet type; rotation angle 70°. Lenses: OM System lenses between f50mm and f200mm. 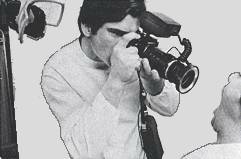 Focusing: Directly outward telescoping motion with lock at any position (locking rotation angle 15°). Automatic aperture control: Bayonet mount for interlocking with lens diaphragm and meter coupling lever for automatic stop down control and exposure metering. Tripod mount: Accepts any tripod, allowing photography at any angle. Magnification indication: For automatic aperturing with Zuiko MC Auto Macro 135mm and MC Auto-1:1 Macro 80mm lenses; with scale from 65mm to 115mm in 5mm increments. 1× to 2× Zuiko MC 1:1 Macro 80mm F4 + Close-up 80mm Macro. Do not move the slide ring when locked. If incompletely locked, the extension rings may sometimes slip out of position. Be careful to securely lock before taking a picture. Make it a point to insert the extension ring (A) into the side ring for ascertaining the magnification indication. Avoid pulling or pushing the extension rings by	inserting fingers into the rings to avoid damage. If dust or dirt collects inside the tube clean with an air blower, etc. After the unit is used in high humidity and	temperature, wipe it clean completely. If the unit is rapidly transmitted from low to high temperature places, it will sometime frost. Wipe it off carefully. If frictional sound is audible by sliding the extension rings, or the built-in bearings sound when you swing the unit, it does not matter. Do not stand the Auto Tube on its meter coupling lever or do not apply pressure upon it. Do not move the Auto Tube while clamped on the tripod. If pressure is applied to the tube release button while mounting on the camera the red dots on the mounts sometimes do not coincide with each other. Setting the button free, rotate the ring until the button springs up. For use of a tripod, make sure to attach the tripod to the Auto Tube (not the camera). Do not use two Auto Tubes or more simultaneously or an Auto Tube in conjunction with extension tubes. The OM-2’s electronic brain centrally controls all exposure data to do away with complicated calculations. It automatically shuts off the ring flash emission when the correct amount of light has reached the film surface. 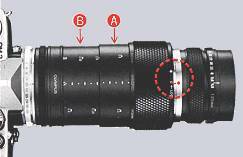 By sliding the Telescopic Auto Tube 65–116, changes in magnification can be monitored continuously in the viewfinder. 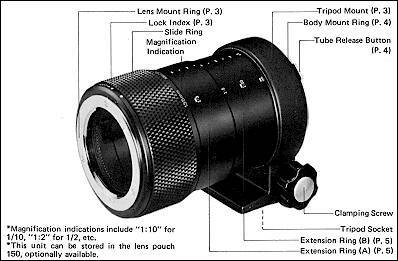 The MC Auto Macro 135 mm lens features long working distances 37cm (14.6″)–∞, enabling the photographer to take enlarged images of a lesion without interrupting surgical procedures. The MC Auto 1:1 80 mm Macro is designed to provide optimum resolution at life size. 4. Although the Macro 135 mm has a maximum speed of F4.5, it allows full-open aperture viewing as bright as F4 to facilitate focusing and composition. With the aid of the cross polarizing filter POL, the ring flash reproduces glossy surface objects, reducing undesirable annular light reflection. The compact and convenient design of the equipment ensures mobility not only for medical, but also for outdoor action photography. The ring flash operates off batteries (inside the T Power-Control 1 which is mounted to the camera, or a 6 V Power Pack attached to the waist) or the AC Adapter 3. Together with other modular OM System components, ring flash is useful in a wide variety of photographic situations (Recordata Back, Winder, etc.). The ring flash equipment does not feature explosion-free construction. NEVER use it in the presence of flammable gas. To prevent overheating, do not cover the AC Adapter 3 with a cloth, etc. Depending on the film used, the Ring Filter POL can cause a slight change in coloration (gold tends to turn out bluish; and red, bright red). 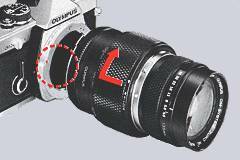 The POL cuts down light by 3–6 stops, so open up the lens aperture accordingly to compensate for the light loss.